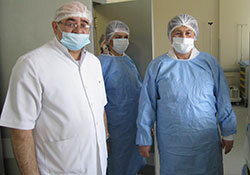 Ms Zsuzsanna Jakab, WHO Regional Director for Europe, has been in Azerbaijan this week to discuss cooperation with the Ministry of Health, and develop plans for the annual meeting of WHO/Europe’s governing body, to be held in the country in September 2011. During the visit, she met with Professor Shiraliyev, Minister of Health of Azerbaijan. Professor Shiraliyev explained that hosting the sixty-first session of the WHO Regional Committee for Europe in Baku will provide an opportunity to showcase health development in the country. Ms Jakab thanked the Minister for hosting the session, and expressed her wish for WHO to continue providing technical assistance to Azerbaijan. During the meeting, Ms Jakab and Professor Shiraliyev signed a cooperation agreement to reinforce commitments and facilitate preparations for the Regional Committee session. The visit also enabled Ms Jakab to discuss health issues in the country with Mr Elchin Efendiyev, the Deputy Prime Minister of Azerbaijan. Explaining that tackling noncommunicable diseases was high on the Regional Committee’s agenda, Ms Jakab invited Azerbaijan to become a pilot country in drafting a national action plan on these diseases. The theme of World Health Day 2011, antibiotic resistance, was also discussed, and Ms Jakab again appealed to the Deputy Prime Minister for Azerbaijan to be a leading country in addressing this issue. Mr Efendiyev agreed that health-system reform is important in Azerbaijan, as in all countries, and explained that the President was committed to this and to addressing inequities in the country. Azerbaijan has been a WHO Member State since 1992. WHO officially established an office in the country in 2004.